Party season is in full swing until New Year's Day. If you are hosting a party where your guests have the option to imbibe alcoholic drinks, here are a few pointers on how to set up a bar for a party. 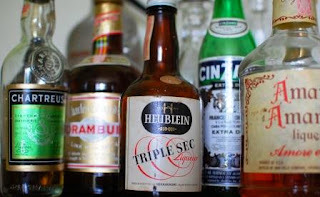 A few select libations can go a long way - Please note that you do not have to have thirty different types of liquor, or even thirty different varieties of the same liquor, to have a decent cocktail bar. Here are my top five alcoholic drinks to keep on hand as a base for drinks: rum, bourbon, vodka, tequila, and gin. Help your guests out - Cocktail books or a list of potential or well-known cocktails for your guests to try. We had a chalkboard that had a "Drink of the Day" recipe on it during our backyard parties this summer. Have something for your designated drivers - Have the fixings for "mocktails" like cokes, coffee, juices, sparkling water, or other non-alcoholic drinks available. Give your guest the right tools - Toothpicks, strainers, tongs, ice - lots and lots of ice, and shakers. Mixing it together - Club soda or tonic water, ginger ale, orange juice, cranberry juice, cream, Coke/Diet Coke are common mixers. Add pizzazz - Lemon and/or lime wedges, olives (w/juice), cherries, and/or simple syrup are easy ways to jazz up a drink. Cinnamon or peppermint sticks are great at the holidays. One for glasses, napkins, etc. Something to think about, in colder weather, keep the drink station outside. You'll use less ice and will keep guests moving in different areas so there is less of a bottle neck inside your house. Please drink responsibly this holiday season! I also try to include at least 1-2 hot drinks as well, especially coffee. Both drinkers and non-drinkers can enjoy! Love the tips! Oh yes ma'am, I serve coffee at every party no matter what. :) Thanks for stopping by Ms. Michelle! Well thanks so much Ms. Aleshea! So fun! Will have to keep this in mind before we host Christmas at our flat.